The next day Mhumhi left Kutta with Tareq again and took Maha out to the giant grate. He had only told Kutta he was going to get food again, not the where or why. She was in no state to make sense of it, anyway- her sickness had taken a turn for the worse again, and she could only lay there, half-delirious, lapping weakly at the bowl of water Maha brought for her. She had begged Mhumhi to take Tareq, too, for fear she would bite him again, but Mhumhi had not thought that there would be any trouble there. Tareq was staying as far away from her as he could now, pressing himself against the opposite wall where she was lying and keeping himself deeply buried in his nest of blankets. “Look!” said Maha, bringing him back to the present. They were standing on the concrete platform next to the water rushing through the grate. Maha had put her hand up in a gesture Mhumhi was beginning to recognize as pointing, indicating a round circle on the ceiling. Affixed next to it was a gray plastic box. “Yes,” said Maha. She went over to the wall and started climbing- there were metal rungs like there had been underneath the manhole in their room. Mhumhi watched her go up, nimble as a gray fox. His tail waved slowly. “You won’t need to!” said Maha. She had gotten up the wall and was now moving, hesitantly, entirely upside down on the ceiling. Mhumhi licked his lips and couldn’t stop himself from running back and forth underneath her, craning his neck back. “I’m fine!” Maha replied, though there was a nervous quaver in her voice. She wrapped one elbow around a rung and reached out, fingertips trembling, for the plastic box. Mhumhi couldn’t stop a nervous whimper bubbling up after she missed her first attempt and grabbed the rung again. Mhumhi tried to keep quiet, though he was still pacing in circles underneath her, staring up. She reached out again, and this time her fingers connected with the little clasp on the front of the box. “Look out, Mhumhi!” she said, which was all the warning he got before the box fell open and a latter clattered down loudly as it unfolded. It was lucky he hadn’t been standing more to the right, Mhumhi thought, tucking his tail, for the ladder had banged down on the floor there and partially folded back up from the force of it. Maha now made her painstaking way back down, rung by run, looking very relieved to be back on the ground again. Mhumhi went over and gave the thing a hesitant sniff. It was true that it was at much more of an angle than the metal rungs, but he did not like those huge gaps between the steps. “I’ll go open the manhole,” said Maha, and she pushed in front of him to tug the ladder down the rest of the way, straightening it with a loud clang. He eyed the ease with which she scaled it rather enviously. “What, what is it?” Mhumhi asked, practically running circles around the ladder’s base. She had stiffened suddenly. “Come down, Maha,” Mhumhi urged, and she came quickly back down the ladder to go put her hands on his neck for reassurance. Maha went, her flat feet slapping loudly on the concrete, pausing only to give him a frightened glance over her shoulder. Mhumhi tried not to look at her, for his instinct had been to tense and want to chase her. He forcibly put the image out of his mind. He had no time to envision horrors. He needed to chase down whoever had seen Maha, first of all. He took the ladder at a run, which might have been the best plan, for it rattled and shuddered unnervingly under his feet. At least his paws did not slip, and he was able to leap straight out of the manhole and onto thankfully solid concrete. He put his nose to the ground at once. There was little scent in the area, and few paw-marks had disturbed the layer of crumbling plaster dust. But there was a single, distinct splash of urine against a wall a few meters away. It smelled like fear. Mhumhi ran to it and inhaled deeply. It had been from a medium-sized animal, a male, and he had left a wet pawprint behind in his flight. He was still sniffing with the intent to track it, but he needn’t have bothered. The very same individual came back around the corner while Mhumhi’s head was still down and froze at the sight of him. It was a culpeo, a large fox, but nothing compared to Mhumhi’s size. Mhumhi straightened and raised his chin very hight. The culpeo stared at him a moment, curling his luxuriant tail underneath his legs, and then slunk over to him. “Yes, police?” he said, keeping his eyes down. Mhumhi was relieved; he’d been counting on the assumption. The culpeo squirmed a moment, the muscles around his lips tensing, perhaps trying to gauge the answer that would please Mhumhi the most. “You think, or you know?” said Mhumhi, and the culpeo cringed. Now the culpeo’s eyes were starting to look very bright and sharp. “I’ll find you again when I need to,” said Mhumhi, letting his canines show slightly at the end, and the culpeo spun around and dashed down an alleyway at top speed. Mhumhi allowed him a moment to gain some distance, then gave a little bound and a play-bow, tongue hanging out with laughter. That had been more fun than he’d thought. Maybe he should pretend to be intimidating more often! He did not let himself get distracted for too long, though; he shook himself and trotted up the street, in the opposite direction towards Wide Street. It was a roundabout way to get to the school, but there was a certain area- a certain light post- that he wanted to avoid. He made good time. The streets near Wide Street were emptied out for the morning dispensary run, but he could smell the aftermirage of hundreds of strange dogs, large and generally frustrated. They must have been the new squatters. He didn’t see a hair of a fox anywhere; Sacha must have been right about how the balance of power would shift. He thought back to Lisica and wondered if she and the other foxes planned to act. Would they act against the police, or the domestics- or had they realized about the existence of the hyenas? He was almost glad that he’d been confined to the sewers the past two days; if there was going to be fighting in the streets, he did not want any part of it. He skirted round the part of Wide Street that aligned with the dispensary. 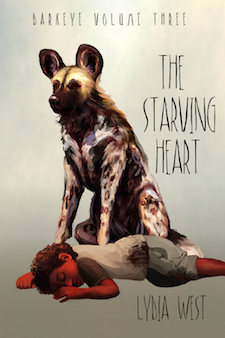 There was a trickle of dogs leaving it, and a trickle of dogs arriving, but none gave Mhumhi more than a glance. As far as these strangers were concerned, he was a member of the police, and not someone to tangle with. Mhumhi had never felt so glad for his dappled coat before. He was half-entertaining the idea of going straight up to the dispensary and getting his meat by the time he reached the school. He ducked through the gap in the fence around the playground, feeling the wood chips under his paws. What could the police do to him, really, if he said he was part of the crowd, just someone from another district…? Ah, but that would be so risky. He nosed around the roundabout, but the family of fennecs that had once lived underneath had moved, it seemed. He could see the dark space of the den they’d dug gaping empty. He got up on his hind legs and pushed the roundabout, for fun, hopping on his hind legs until it spun lazily. He jumped up on it and sat a moment, tongue hanging out as he spun, before he remembered he was supposed to be police and anyone who happened to see him would think his behavior had been very un-police-like. He hopped back over the playground fence, wincing a bit as he landed on his injured leg, and then hugged the wall, searching. He found several doors, all of which felt heavy and metal and did not yield to his pushing. He was almost starting to get worried when he turned yet another corner and saw the ladder. It was leaning up against the wall at a very steep angle, but up at the top he could just glimpse a window that looked open. Mhumhi’s tail, which had been waving gaily, slowly went down. He did not like ladders at all- why did they keep coming into his life? But there was nothing he could do. He braced himself and took the ladder at a run, as before. This turned out to be a terrible mistake- this ladder was not affixed to anything, and as he hit it it bounced off the brick and wavered backwards. Mhumhi hooked his paws over and hung on for dear life, heart hammering, as the ladder eased back and thumped back against the wall. He took it more carefully, though it hurt his leg a bit, step by step, feeling each wobble with trepidation. It was a relief when the open window finally came into view, just ahead of him. He put one paw on the windowsill. The face of the blue-eyed domestic suddenly appeared before him, full-sized, and with a growl the dog reared up and shoved the ladder backwards. Mhumhi gave a kind of shriek as the ladder pitched backwards, his paw scraping off the windowsill. More by instinct than anything else he pushed off the top in a frantic leap and sailed through the window and on top of the domestic. They were both very startled, and Mhumhi actually had a moment to sit there, on the other dog’s thick furry side, catching his breath, and then the domestic growled and twisted out from underneath him. He was quite different from when Mhumhi had last seen him- no longer was he cringing and whimpering, now he was snarling in quite a terrifying display of aggression, gnashing his teeth as he barked. Mhumhi backed up against the wall, panting, and had to leap for it when the domestic lunged at him. He landed on a desk- there were a great number of them in the room- and jumped again when the domestic slammed his thick body on it, growling and snapping. The domestic leapt at him, slamming the desk so that it shrieked and slid against the linoleum, and Mhumhi fell off and hit his shoulder hard on the floor. At once the domestic was on top of him, his teeth flashing for Mhumhi’s throat, and Mhumhi shoved his head away with his forepaws and rolled and got to his feet, gasping. When the domestic whirled to lunge at him again he met him with a snap of his own, catching him by the nose and drawing blood. The domestic backed up at this assault, panting, blood shining on his nose. The domestic stared at him, his pale eyes uncomprehending, but at least he had stopped growling. Mhumhi decided to press on. Mhumhi had not, in fact, thought of this; furthermore, now he was suddenly recalling his first sighting of a hulker, when it had been dragging around a dead coyote and had promptly tried to bash his brains in. Perhaps this situation was not ideal, after all. “Then come,” said the domestic, surprising Mhumhi, who had thought he might want to ask more questions. He pushed past him and out the open door of the desk-filled room they were in, his curled tail vanishing from sight. It took Mhumhi a second to realize he was meant to follow him. The inside of the school was filled with long hallways and rows of rooms. Mhumhi’s nails clicked against scratched, dirty linoleum as he gazed nervously around. He was not sure exactly what a school was- from the looks of it, it was a place where you stored chairs and desks. The domestic led him down one of these long hallways, around the corner and down a set of stairs. Here there were strange papers on the walls, faded and tired, many only hanging by their corners. Mhumhi could not grasp what images were supposed to be on them- they just looked like random blobs of color, very different from the normal lifelike imagery one saw on these things. The domestic paused at a brown door and reared up to scratch it. There was silence behind the brown door, and the domestic scratched more insistently. “Leave me be,” called a piteous, musical voice- Mhumhi started to realize it was a hulker’s. “Why are you talking in Dog?” It went on to say something else that Mhumhi couldn’t catch, in a strange, liquid tongue. The domestic replied in kind, though in his mouth the words were more halting. He scratched on the door again, and after a moment the door opened. Mhumhi was startled again, because two things happened very rapidly. He recognized the hulker as the one that had been dragging the coyote, and was promptly bashed on the head and knocked to the ground. The domestic was laughing at him, he realized in a dazed way, as he struggled to get back to his feet. The hulker was swinging a broom around. The hulker hesitated, and exchanged a glance with the domestic. “He means human, Lamya,” said the domestic, and the hulker’s nose wrinkled. Mhumhi looked at the domestic for some clue as to what that meant, but he had already risen to follow her inside the room. Mhumhi limped after him. Inside the room there were several tired old couches, a long counter, a white refrigerator, and a shiny black box of some sort. The counter was covered with cardboard boxes, and unless Mhumhi was mistaken, the cabinets below were stuffed full as well. Mhumhi had to pause to sniff the air. There was a scent coming from the boxes that he was unfamiliar with, but found oddly appetizing. The domestic went to jump up on one of the couches, and Mhumhi decided to follow suit on the other. It gave him a sudden pang of longing for his old home, where the couch had been ripped up to just the right level of comfort… this one was hard and scratchy. The hulker did something to the black box, which hummed, and then dragged a low table towards them. Mhumhi thought this was a bit rude, considering she was sitting right across from him. The domestic looked at him. “My name is Mhumhi,” he said. “This is Lamya,” said the domestic, rather formally. “And your name…?” Mhumhi prompted. Biscuit gave his curled tail a grave wag. “Give him a cracker, Biscuit,” said Lamya, thrusting the opened box at the domestic. He stuck his muzzle inside and dropped something on the table in front of Mhumhi. “For you,” he said. Lamya was grinning. Mhumhi got to his feet on the couch and sniffed the thing- it smelled dry and tasteless, and was the color of old paper. He mouthed it cautiously and found it to be surprisingly salty. She tossed the box on the table, and crackers spilled out. Neither Mhumhi nor Biscuit made a move to take one. Mhumhi was still working on getting the rest of his original cracker unstuck from the roof of his mouth. “I haven’t harmed them!” exclaimed Mhumhi, and Lamya laughed. He found he did not like her laugh- it sounded too close to a hyena’s. Mhumhi stared at him, both for the evident familiarity he seemed to have with his mother and the disdain in his voice when he spoke of her. “Clearly his mother didn’t teach him everything,” said Lamya. “The proper word is children,” said Biscuit. “They’re our puppies,” said Mhumhi, and now he exposed a single fang as Biscuit began to growl. Biscuit straightened up at this, staring at Mhumhi, but Lamya put her hand to her mouth and burst into peals of laughter. “I’ll tear out your filthy tongue, you-” Biscuit started to growl, but Lamya grabbed him by the scruff. “Lamya,” said Biscuit, his tone warning. She flapped a hand at him. Mhumhi wavered on the couch, wanting to question again what she had meant, but feeling certain he would rather not know the answer. In the midst of his thoughts there came a loud, shrill squeak that made him jump. “The tea’s ready,” Lamya said, and pushed herself up from the couch and busied herself in front of the black box. In her absence Biscuit seemed to recover completely from his cowering. “You’d better be more careful about what you say,” he told Mhumhi. Mhumhi found that he could use his pale eyes to good effect when he glared. “Leave him alone,” said Lamya, returning with things in her hands. “I’m enjoying myself- we never get anyone new to talk to. And here’s your tea, Mhumhi.” She put something down in front of Mhumhi, a sort of taller, thinner bowl like the one Maha had. There was liquid in it that smelled bitter and steamed. Mhumhi eyed it, wondering if she really expected to drink it. She had taken hers up to her face to start drinking in the hulker fashion, with the lips. Mhumhi stared at her blankly, not even pretending to have been able to comprehend a word she’d just said. “What’s a bird?” asked Biscuit. “Botanical Dome…?” Mhumhi repeated, wrinkling his brow. “The Great Glass Garden,” Biscuit translated. “Is it?” Mhumhi was starting to get weary of feeling like he was being ridiculed. He lay back down on the couch. “What whole thing?” asked Mhumhi, the fur on his back rising. Lamya took another long drink of her tea. “What’s a parrot, Lamya?” Biscuit asked, his blue eyes wide. “I haven’t had any puppies,” said Mhumhi, who was now thoroughly confused. Lamya sighed and let her head fall back. “Killed a-? No, no I haven’t,” said Mhumhi, flicking his eyes away. “You’ve wanted to, though, haven’t you. Like the dog you are. I know about those hunts that take place up in the bloody park. D’you see this?” She raised her covering slightly, and Mhumhi glimpsed a cord around her smooth dark belly. “What’s it for?” Mhumhi asked. Biscuit put his ears flat against his skull. “I don’t like the idea of being eaten alive,” said Lamya, settling back into her chair. Her scrutiny made Mhumhi have to pant. There was no way she could possibly know he’d participated in a hunt and eaten hulker meat, was there? “You’re saying too much, Lamya,” said Biscuit. She ignored him. “He took the ladder at a run, which might have been the best plan,” might not have been? “I remember then- there used to be some in the Botanical Dome” remember them? Yeah… Lamya’s maybe a little loosely wired.